Does your Samsung refrigerator make strange noises, leak water all over the floor or freeze your milk? If so, it’s very likely you need repairs done. The more quickly the repairs are completed, the sooner you can continue confidently using your Samsung refrigerator for years to come. 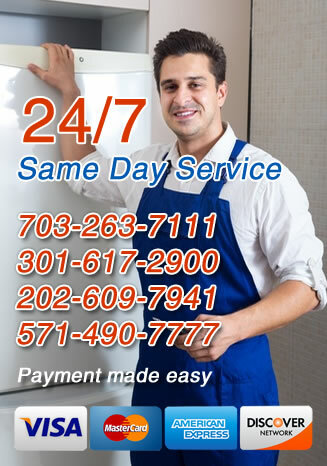 If you live in Virginia and the greater Washington D.C. area and are worried about your Samsung fridge, call All Time Services today for Samsung refrigerator repair service in Virginia and Washington, DC. We have trained technicians standing by, waiting to inspect and repair your refrigerator. With years of experience repairing Samsung refrigerators you can be sure we’ll get yours back on track quickly. If you notice any of these problems, it is likely because of a specific malfunction or broken part in your Samsung refrigerator and a professional should be called to inspect it. You should never attempt to fix the problem yourself, due to the complexity of refrigerators and their electrical components. A trained professional with specific experience repairing Samsung appliances is needed to complete these tasks. The biggest problem most homeowners face is that they don’t know what they need when their refrigerator starts to act up. Many people even think that these problems aren’t a big deal and will go away on their own. You put your Samsung refrigerator at risk by not acting immediately. Without proper care, those seemingly small problems can grow into full blown disasters – spoiled food, ruined floors and a much larger expense when you have to replace the entire fridge. If you need someone to take a look at your Samsung refrigerator, call All Time Services today. 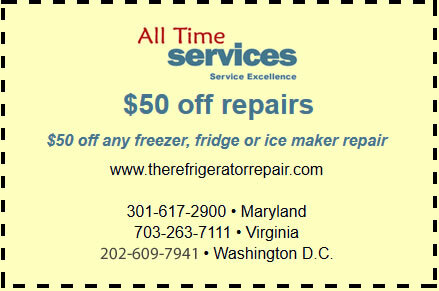 We have years of experience repairing fridges in Arlington, VA, Gaithersburg, MD and the surrounding areas, and we can have yours running as it should in no time.